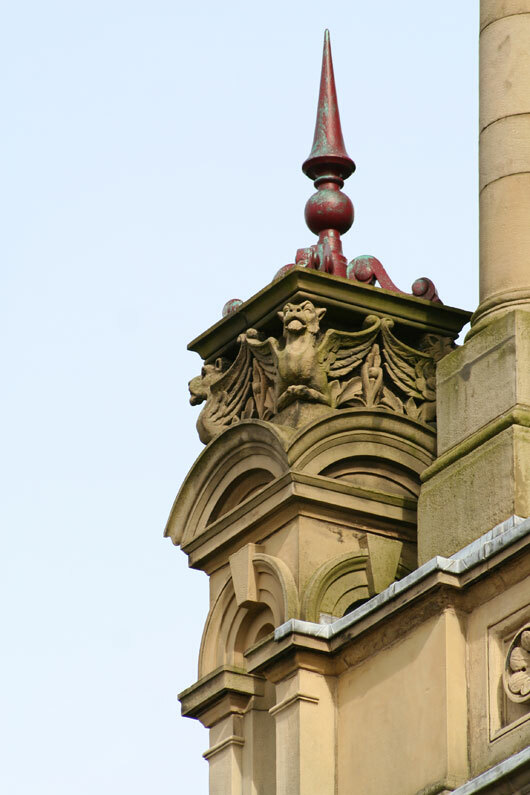 Located on Victoria Road (flanked by lions), opposite The School (now a part of Shipley College). 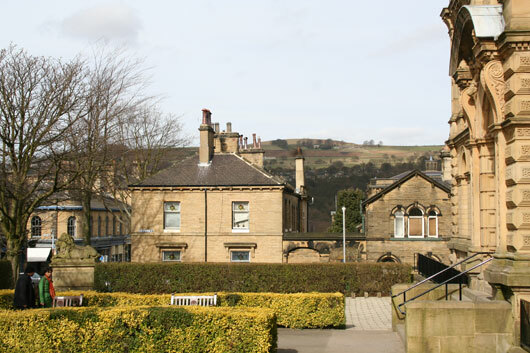 The Saltaire Institute was built between 1867-71 at a cost of £18,366, and was officially opened on the 21st November 1872. Designed by Lockwood and Mawson and built by John Barrie of Scarborough, the building was opened by Titus Salt Jr. It functioned as a social club and an educational institute, with the advantages of a public house without its evils – for innocent and intelligent recreation. Titus Jr. stated it had been furnished at "my father’s expense." It was managed by a committee of 8 people appointed by firm (Salts), and 8 appointed by Saltaire Literary Institute. The Institute was free from any political bias and its objective was to provide the greatest good to the greatest number. The Institute (now known as Victoria Hall) is a symmetrical T-plan building of two storeys and a basement. It is constructed of ashlar rock-faced stone, with a Welsh slate roof. The front façade has a central bay that breaks forward with an elaborate square tower and pyramidal ashlar roof. 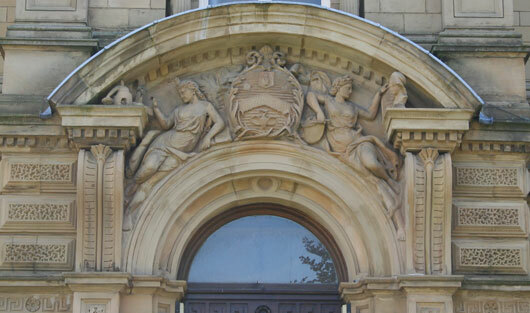 The central portal has a tympanum, with a cartouche bearing the Salt coat of arms, flanked by carved figures by Thomas Milnes of ‘Art’ and ‘Science’. The first floor round-arched windows have carved head keystones. The entrance hall has a large, stone dog leg staircase with turned balusters. The main hall has an elaborately plastered, coffered roof. Outside, on the front corners of the property, two sculpted lions representing ‘War’ and ‘Peace’, also designed byThomas Milnes, sit on large square bases. They sit opposite a matching pair in front of the school, which represent ‘Determination’ and ‘Vigilance’. The main entrance is on the west side of the building, via stone steps. In the foyer, there's a clock, constructed by George Salt who presented it to the Institute and is still in situ in working order. On this (ground) floor, to the left was the Reading Room with daily newspapers and current literature. This room is now known as the Fluke Room after Phil and Pam Fluke. The room on the right functioned as the the library with an adjoining classroom. Ahead was the lecture/concert hall with a stage with a capacity for 800 people. It had a balcony, which has since been dismantled. On the first floor at the front the 2 rooms were for the School of Art for elementary and advanced students. There was a Billiard Room with 4 tables and a Committee Room. On the lower ground floor: a lecture room for 200 people was dedicated to science with a connecting laboratory with apparatus. There were rooms for chess and draughts, a bagatelle room and a smoking room. The 39th West Riding Rifle Volunteers, who were established in 1859 practised their drills in the drill room and gymnasium. They had an armoury where they stored their Snider rifles. In the gymnasium there were trapeze, horizontal bars and hurdles – everything necessary for “muscular development”. There was space for the curator to live. To access and participate in the Institute, there was a quarterly subscription, with fees from 2s 6d per quarter. It was open to all. Salt was made a Baronet in 1869 and was therefore entitled to an official coat of arms. 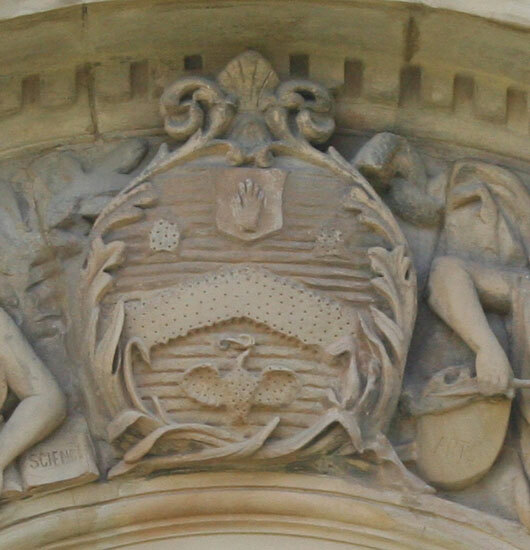 The Institute bears the official coat of arms which includes the palm of a hand. Complete external repair and restoration has been undertaken. 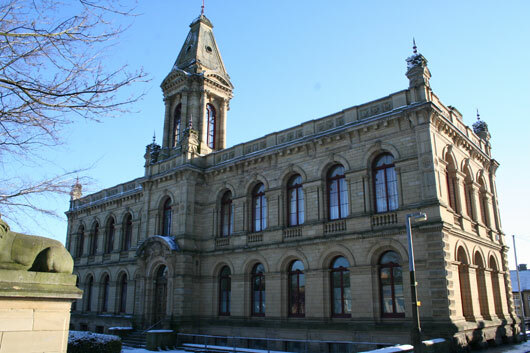 Now known as Victoria Hall, the building provides meeting rooms, which are used by the community for a variety of social uses and is licensed to conduct weddings.PICTUREVictoria Hall formally known as the Institute is owned by the Salts Foundation and leased on a peppercorn rent to the City of Bradford Metropolitan District Council. The hall is generally in a good state of repair following an extensive refurbishment by the Council in 1992 at a cost of £1.35million. This included repairs to the roof, decorative stonework and windows, the stabilising of ceilings and full redecoration. There was further restoration to the building in 2006, and it was reopened by Dan Salt, the great-great grandson of Sir Titus, on the 21 December 2006. The basement floor is sub-let to Shipley College, the ground floor housed in one room a world renowned reed organ and harmonium museum run by Phil and Pam Fluke, with examples of the instruments from all over the globe, but this closed in 2011. The other rooms on the ground floor and first floor are rented out for weddings, meeting and performances. The gardens to the north and south at the rear of the building require maintenance. Victoria Hall now functions as a rather grand Village Hall. The rooms are available to hire and it has a licence to conduct marriages. The figures above the door represent science (on the left) and art (on the right). The Salt coat of arms. Notice the left hand in the top, middle which signifies Titus Salt's baronetcy, which was awarded in 1869. The Coat of Arms is described as: ‘azure, a chevron indented between two mullets (stars) and a demi ostrich holding in the beak a horse shoe in base or (gold)'. Azure (blue) = loyalty & truth; Chevron = protection for those who have accomplished some faithful service; Mullets (the five-pointed stars) = divine quality bestowed from above; Ostrich = willing obedience & serenity; Horseshoe = good luck & protection; Or (gold or yellow) = generosity. 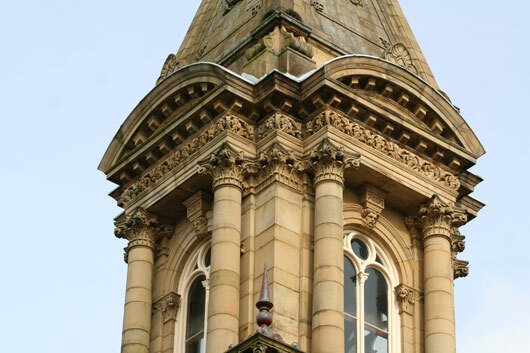 Victoria Hall, Saltaire: showing architectural detail. Victoria Hall - in the garden, looking north towards Hope Hill. The gargoyles which guard every corner of the building.